Don’t cry over spilt cream! We welcomed Alison our pet horticultural therapist who identified some mystery veg for us, happy days! 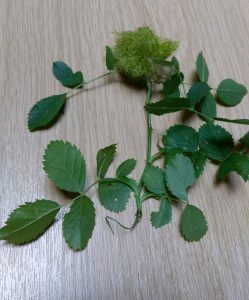 Also we found a hairy rosehip in which little insects were growing. On looking it up we found it to be the lavae of a wasps, up to 30 can inhabit one of these fuzzy galls. There seemed to be a theme of reconnecting with family, sometimes against the odds with long lost relatives, Alison also reconnecting with Greencare when she’ll joined us today we were so happy to see her, especially as she will be joining us again. She also brought with her a delicious Dorset Apple cake which she made with her own fair hands, she has many talents! 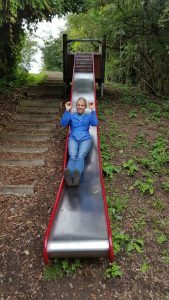 We enjoyed a lunch of the ultimate comfort food tuna pasta after which we took Alison on a tour of the site to view our veg and re-initiate her by sliding down the slide, see pic. Dhush joined us for some cake, it’s so nice to have visitors. In explanation of the title, we spilt cream out of the fridge, but luckily it was old cream that we needed to rid of, always a silver lining eh? We worked as a team to mop it up and clean the floor, not an easy task. We ended the day with a game of pick up sticks in which Sharon our resident champ wiped the floor with us..